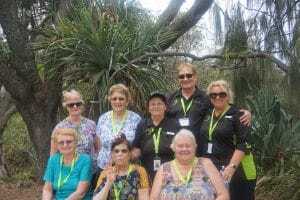 On Tuesday, around 50 of our Community Flyer Adventurers set off on a day trip to North Stradbroke Island. 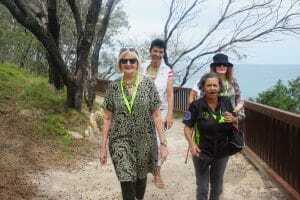 We left early and took the bus onto Stradbroke Ferries for a very smooth ride across the bay. After a lovely drive to Point Lookout, we arrived at French Ease cafe at the Point. We enjoyed fabulous, homemade croissants, scones with cream and jam and a variety of French pastries and cakes along with our choice of coffee, tea or juice. With all that cake and coffee on board, many of us set off on the Gorge Walk and enjoyed some amazing views and diving dolphins. Those who didn’t feel as mobile sat at the Point and enjoyed the scenery and the ocean breeze. We then headed to the Stradbroke Hotel in the upstairs, function room with more great views, for a sumptuous two course lunch. We probably relaxed there a bit too long, but we couldn’t tear ourselves away, so didn’t get to drive into Amity Point for ice cream (not that we needed it!). Our Flyers enjoyed a smooth trip back on the ferry and then to our meeting place where our Mt Gravatt Coach and Travel bus was met by our Community Flyers for the trip back home. Our Community Flyer Adventures are a door-to-door, all-inclusive service, open to anyone with higher levels of mobility. We love taking our clients with wheelie walkers and walking sticks for a great day out! 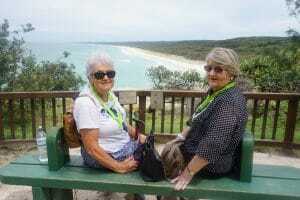 These are all inclusive trips including door-to-door transport, morning tea, lunch and the activity. For more information on upcoming trips, call our TransitCare team on 1300 153 636.